"Biofabbrica di Ramacca" is a plant to produce beneficial insects for the fruit farming sector. It is managed by the Sicily Region's Agricultural Development Agency, and it is a single example of plant in the rearing of natural enemies for pests' biocontrol managed by a public entity. 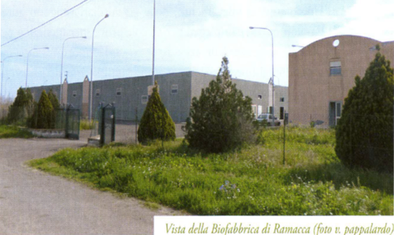 The Biofabbrica di Ramacca, founded in 2007, is the Sicily Region's flagship in the international scenario and it represents one of the 26 European companies that rear species of beneficial insects for the biological and/or integrated defense. It was born as a result of a project carried out by the Sicily Regions' Agricultural Development Agency in collaboration with Biolab, the fruit and vegetable Center of Cesena. The establishment covers about 3.5 hectares and it is equipped to produce 3 species of insects, thought for fight-programs in the citrus-growing (Aphytis melinus, Criptolaemus Montrouzerii. Leptomastix dactylopii), and the production of one species of insect (Diglyphus isaea) to be used for the integrated defense of greenhouse productions. The Biofabbrica di Ramacca produces, on average, about 120 million insects yearly and it serves over 5 thousand farms on the Sicilian territory. 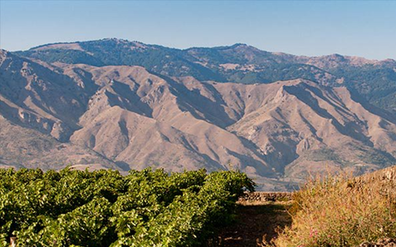 The "Lorenzo Frasson" farm is located on the border of the provinces of Enna and Catania on a hilly area. It is a farm of 680 hectares that has benefited from the collaboration between public and private technical assistance. The farm produces mainly arable crops: 250 hectares are cultivated with durum wheat, fallow 66 hectares, sulla coronaria 10 hectares, chickpea 92 hectares, soft wheat 72 hectares, oats/barley 10 hectares. The farm provides a three-year crop-rotation (wheat - barley/oats/ wheat - chickpea/fallow/sulla) to face the problem of the erosion of the Sicilian hilly areas with loss of soil and organic substance due to the excessive processing of the land and the use of very powerful mechanical means and tools. 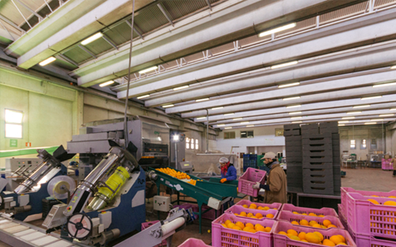 The farm also produces "blood" oranges (120 hectares) by using innovative systems of irrigation. "Azienda Sciaranuova di Planeta sull'Etna" is an excellence wine cellar in the oenological scenario of Sicily. It is a family-owned farm with a high-quality business management. 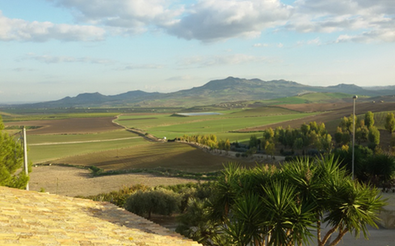 Planeta brothers' farm has 6 wine cellars spread between different Sicilian areas, whose core business is in Menfi, in the province of Agrigento. The wine cellar Sciaranuova was born in 2012, when vineyards of Nerello and Carricante were planted on the north side of Etna, between the lava streams and the woods surrounding Passopisciaro. The reception centre for visitors is located at over 800 meters of altitude in the wonderful vineyard of Sciaranuova. The wine cellar was built in the South, near the vineyard of Feudo di Mezzo, just in the middle of a 16th century lava flow. These lands produce the Etna DOC wine. On Mount Etna other six type of wines are produced, besides the Brut wine (classic method). Piante Faro is among the widest nurseries of Europe. It cooperates with CREA OFA (Research Centre of olive-growing, fruit-growing and citrus-growing). 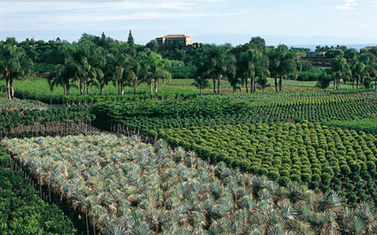 The farm extends on 600 hectares devoted to the growing of 800 plant species and over 5,000 varieties. The production capacity meets every need: medium and large sized trees, succulent and ornamental plants, citrus plants, shrubs, herbaceous plants, 20 to 300-year-old specimens. The farm has 40 hectares of greenhouse plants, 5 hectares of shaded areas and 1 hectare of nursery 11 meters tall to host the most majestic exemplars. Over 20 hectares host the most impressive trees and hundreds of hectares can offer the widest range of Mediterranean and sub-tropical plants of all Europe. The farm has provided its own products to various places and prestigious events: Louvre of Paris, Olympic games of Athene and Sochi, Botanical Garden of Kuwait City and many others. Bio Sikelia is an Organic Farmer Association founded in 2010 by a group of Sicilian farmers with more than 25 years' experience in organic fruit and vegetables production. Bio Sikelia aims to collect in a single basket the products of its members by promoting their placement in the Italian and foreign markets while monitoring the implementation of the cultivation practices and the techniques of organic production, as well as the waste management in full respect for the environment, thus safeguarding the quality of water, soil, landscape besides ensuring biodiversity. The associated farms are mainly located in the province of Siracusa. Whether conditions and the excellent fertility of lands allow the production of high-quality vegetable products. Within the farm, a staff of advisors, who are specialised in organic productions, merges technological innovation to agricultural tradition. Among the marketed production there are also citruses, among with the Valencia oranges and some Sicilian varieties, such as "Limone Femminello" and "Arancio Tarocco". The warehouse is equipped with new-technology-plants for the processing of carrots, potatoes, citruses and leafy vegetables.